Kenyon News Agency, Chicago, Advertisement, detail. This was not only a journey of many weeks duration, it was a route that also subjected the mail carried over it to considerable peril. Steamers on both ocean legs were subject to loss at sea in storms or from explosions of their frequently unreliable boilers. Mail could also be lost on the perilous four to five day overland journey in Panama from mishaps ranging from dangerous portages of alligator ridden lagoons to theft by rampant organized gangs of bandits! 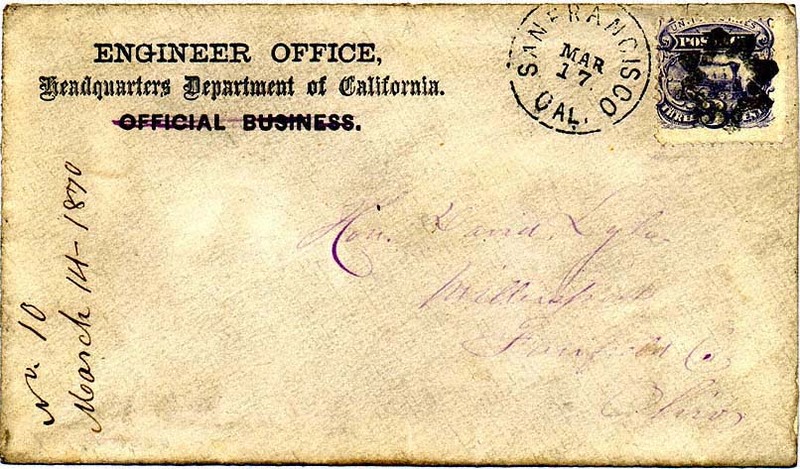 The recipient of this letter, Rodman Price, was one of the key pioneers of California. After the Mexican War, Price was the first official to exercise judicial authority in California under the American flag when served briefly as Alcalde. From 1848 to 1850 he was the U.S. Navy Agent for the Pacific Coast, and in 1849 Price was elected a delegate from San Francisco to the California Constitutional Convention. The Constitution he helped draft and signed that year led directly to the admission of California to the Union as a state in 1850. Price then returned to his native New Jersey where he served one term in Congress from 1851 to 1853 before being elected Governor of New Jersey in 1854. In the Spring of 1853 West Point graduate and former U.S. Senator Jefferson Davis, then the Secretary of War under President Franklin Pierce, organized and dispatched four survey teams under the leadership of members of the Army's Corps of Topographical Engineers to conduct explorations and surveys funded by a $150,000 appropriation by the Congress to examine and report on possible routes for a Pacific Railroad. By the time the "Pacific Railroad Act of 1862" (12 Stat 489) was finally passed and signed by President Abraham Lincoln nine years later on July 1, 1862, however, Mississippian Davis was President of the Confederate States of America (CSA) and the Civil War was well underway. 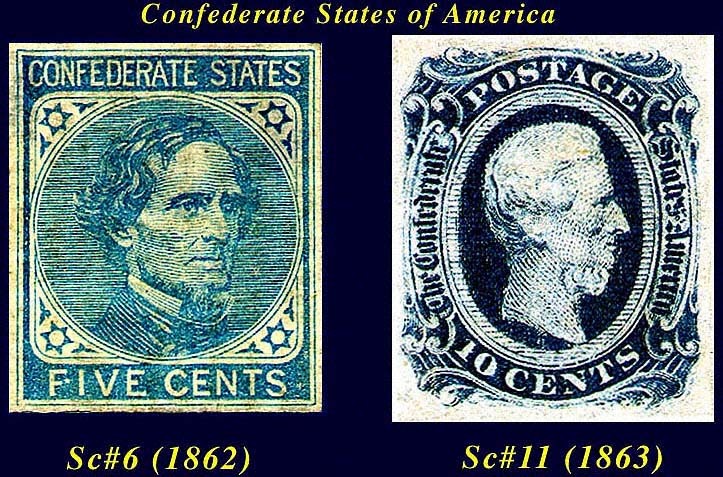 The two above CSA postage stamps issued in 1862 (Sc#6, 5-cents) and 1863 (Sc#11, 10-cents) bear portraits of Davis who, during his time both as a member of the U.S. Senate and as head of the War Department, had been a strong advocate for the construction of a Pacific Railroad with U.S. Government support. That first railroad to the Pacific would indeed be funded and built, of course — but for obvious reasons not by way of the Southern route that Davis had so dearly wished for it! The 3-4 week Overland Mail used stage coaches pulled by horses, beginning in 1858, as the Congressional appropriation of $30,000 in 1855 to study the possible use of camels did not lead to a practical way to carry the mail across the continent. 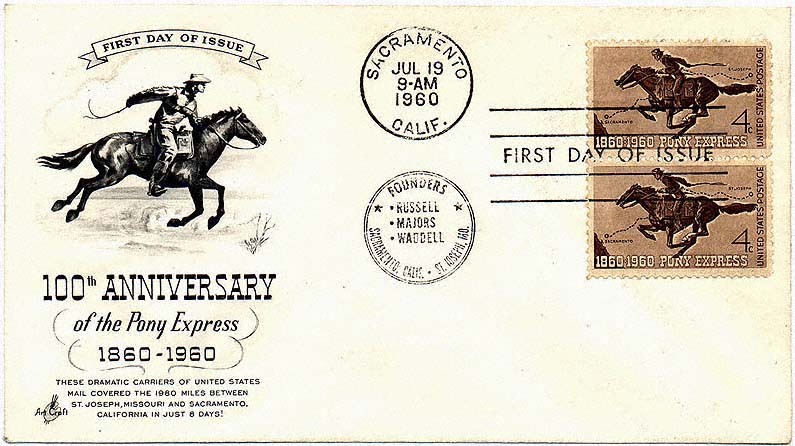 The Pony Express used 400 horses and employed 183 men only for a brief 20 month period starting on April 3, 1860 in order to carry mail and news across 1980 miles between about 165 stations from St. Joseph, Missouri to San Francisco, California once or twice a week in 10-16 days for $5.00 per 1/2 ounce letter, later reduced to $1.00. Riders changed every 75-100 miles, and horses every 10-15 miles. The Pony Express ended on October 24, 1861, when the wires were joined on the first transcontinental telegraph and completed mail deliveries by November, 1861. The rate for a half-ounce transcontinental letter sent over 3,000 miles was decreased in 1851 to six cents (three cents for shorter distances), but this required huge Government subsidies to pay private contractors to carry the mail and did nothing the cut down the weeks or months it took to between posting and reliable delivery. With the opening of the railroad in 1869, however, the problem of speed and reliability was finally solved decreasing the time in transit to a week or less. 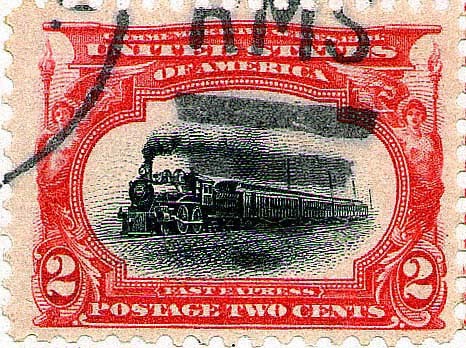 The 1869 3-cent locomotive (Sc114) and companion 2-cent post horse and rider (Sc113) issues illustrated above also marked a fundamental change in the design of U.S. postage stamps. Since the first two U.S. issues in 1847, the 5-cent Benjamin Franklin (Sc1) and 10-cent George Washington (Sc2), every U.S. stamp design but three had featured a portrait of one of these two men. (The other three featured portraits of Thomas Jefferson, Andrew Jackson and Abraham Lincoln.) This exclusivity ended with Sc113 and Sc114. 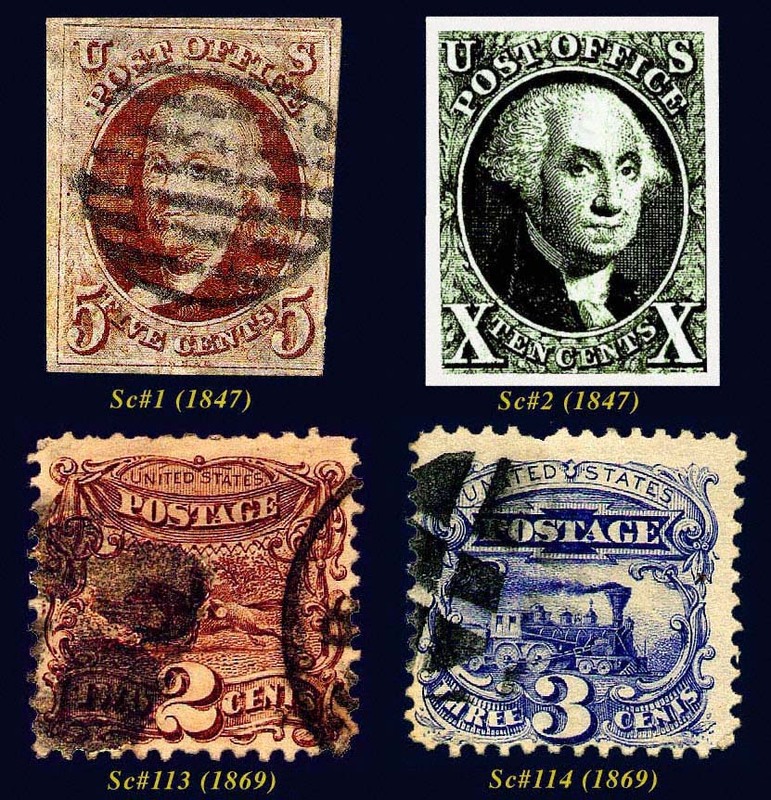 Also note that the 1847 Franklin and Washington issues bore the legend "U.S. Post Office" while every stamp since has used the designation U.S. "Postage" instead. 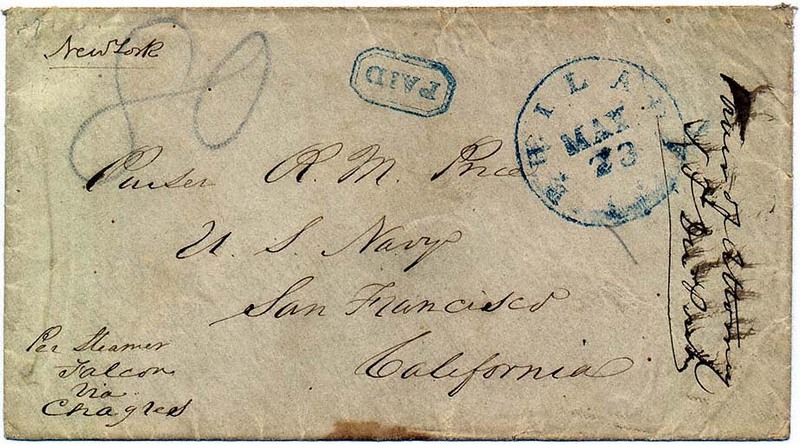 The above July 6, 1870, cover was mailed from Austin, Utah Territory, to San Francisco. The cover is a cream 3-cent U.S. 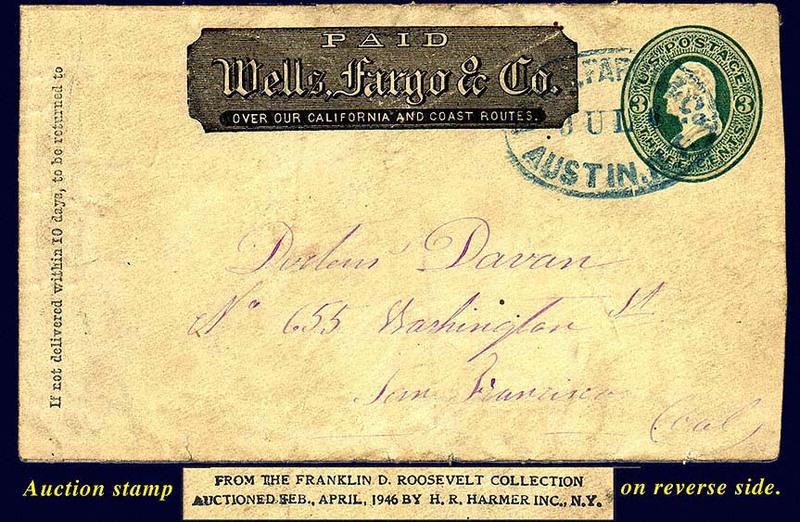 Postal Stationary (U84) imprinted and serviced by Wells, Fargo & Co which also applied the green postmark cancellation. 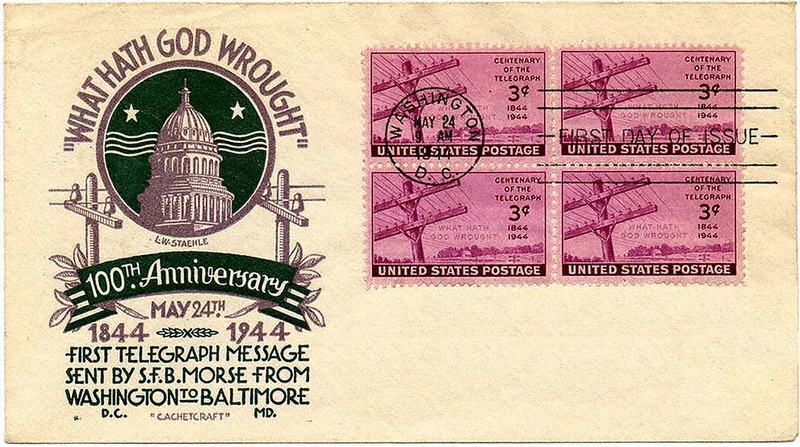 This cover came from the collection of President Franklin D. Roosevelt, one of America's greatest stamp collectors. After his death in 1945, much of his collection (including this cover) was auctioned in New York in 1946 by H.R. Harmer, Inc.
Not all "mail" carried on railroads is franked with U.S. postage. 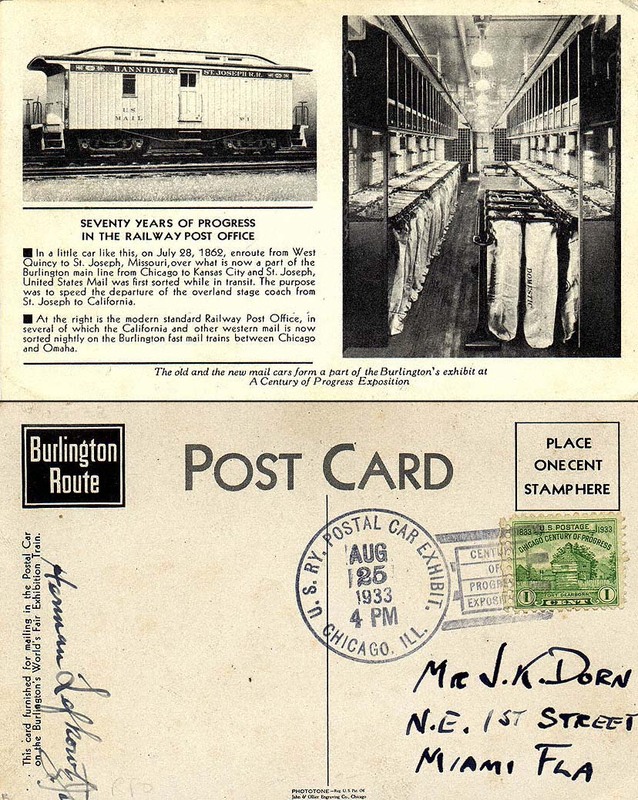 Business mail sent within or between railroads, for instance, instead carried a printed frank "Railroad Business" in place of stamp postage — much the way official business mail of the U.S. Government is sent in "Penalty" covers. 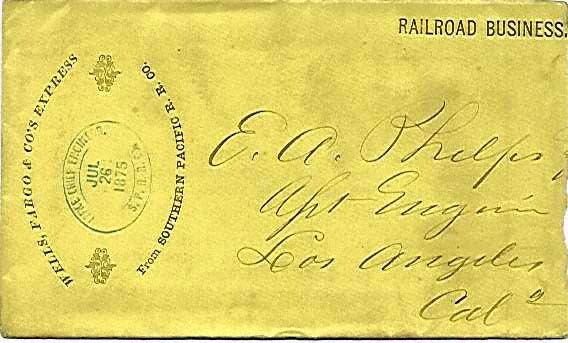 A fine example of this is this July 26, 1875, Southern Pacific Railroad, Wells, Fargo & Co. Express cover sent from the Office of the Chief Engineer of the SPRR to E. A. Phelps, SPRR Assistant Engineer in Los Angeles, California. As the speed and reliability of both commercial air travel and high volume air mail service finally began to develop in the United States in the 1930's, for the first time the railroads saw the specter of real competition to their dominance in transcontinental transportation. 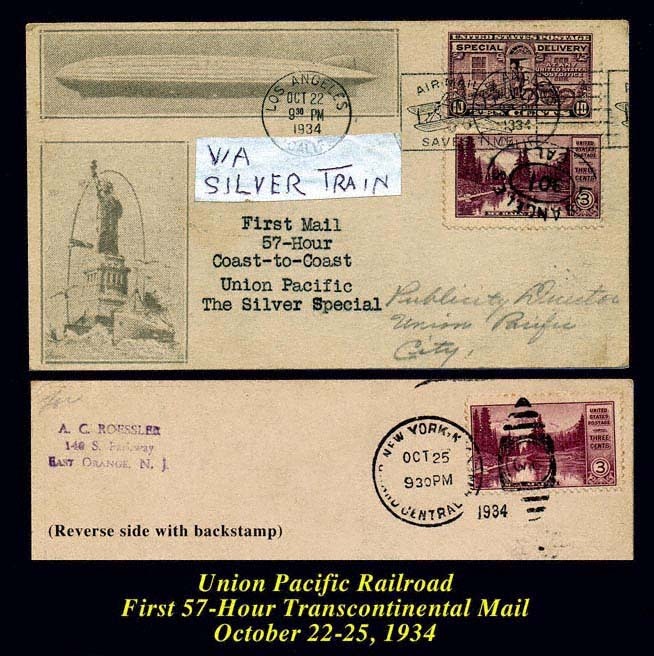 In order to help meet this challenge in 1934 the Union Pacific introduced its first streamlined silver liner train and on October 22nd the UPRR was a part of the first 57-hour transcontinental mail by rail service. The above post card carried from Los Angeles to New York on that first trip was produced by the famous New Jersey philatelic printer and cachet maker, A.C. Roessler. Known mostly for his many historic first flight air mail covers, for this rail trip Roessler ironically used one of the cards he had printed for the many flights on the German airship “Graf Zeppelin” on which he sent mail. As all previous U.S. stamp issues had contained only portraits, the Sc113 and Sc114 issues of 1869 might well be considered to be the first U.S. commemorative stamps. The first U.S. commemorative to officially honor the completion of the transcontinental railroad, however, had to wait three-quarters of a century. The 3-cent Sc922, issued on May 10, 1944, appeared on the 75th anniversary of the driving of the "Last Spike" at Promontory Summit, U.T., on May 10, 1869. 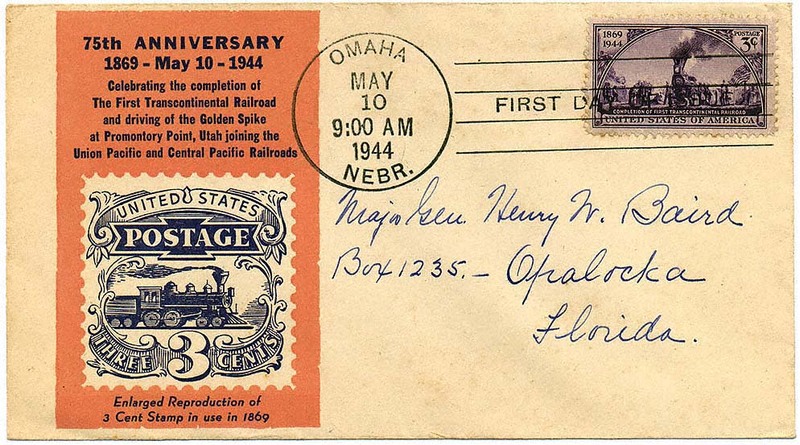 First Day Covers were authorized to be canceled on that date in three cities — San Francisco, CA, Ogden, UT (transition point between the CPRR and UPRR), and Omaha, NE (starting point of the UPRR). The above First Day Cover canceled in Omaha includes an illustration of Sc114 in its cachet. This cover was originally a part of the distinguished collection of postal history built over a period of more than half a century beginning in the early 1920's by the late Major General Henry W. Baird, USA. 75th anniversary of the driving of the "Last Spike"
The July 1, 1862, Pacific Railroad Act signed by President Lincoln not only provided for government aid for the construction of a railroad from the Missouri River to the Pacific Ocean, but also for a transcontinental telegraph line along that same route. 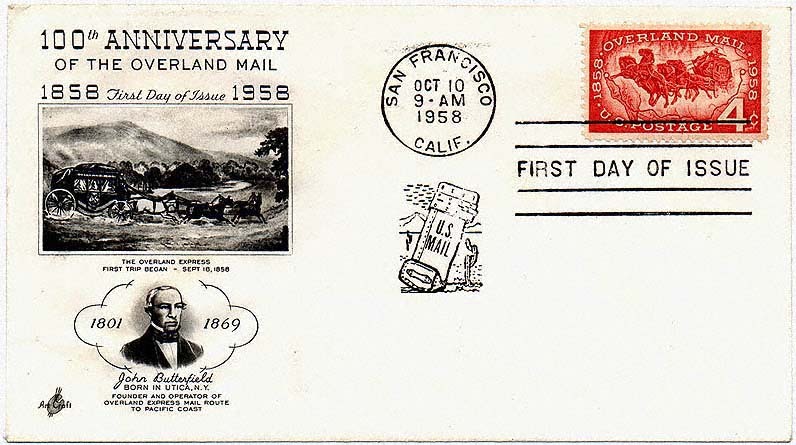 Just two weeks after honoring the 75th anniversary of the completion of the transcontinental railroad, on May 24, 1944, the U.S. Post Office Department issued Sc924 to commemorate the 100th anniversary of Samuel F.B. Morse's first successful telegraph message as illustrated by the above First Day Cover. 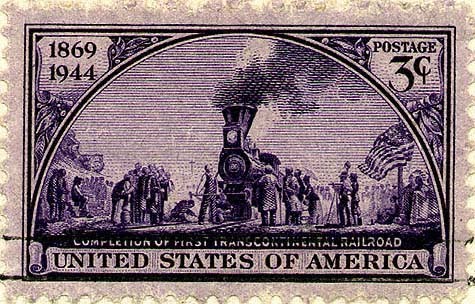 Since the 1869 issue of Sc114, railroads have been one of the most frequent subjects to appear on U.S. postage stamps over the past 130+ years. One of the most beautiful and famous of these was Sc295, the "Empire State Fast Express" two-cent issue of 1901. This was one of a set of six stamps that made up the "Pan-American Exposition Issue" of one, two, four, five, eight, and ten-cent denominations. This set was issued on May 1, 1901, in conjunction with the opening of the Pan-American Exposition in Buffalo, NY, which is unfortunately best remembered for the assassination of President William McKinley who was shot while visiting the Exposition on September 6, 1901, and died of his wounds eight days later. As were all multi color stamps in this era, Sc295 was printed one sheet at a time each of which was fed through two different presses. After the black subjects were printed the red borders were then added as a separate impression. Unfortunately (or fortunately for stamp collectors) one sheet was inadvertently run through the second press upside down resulting in a famous printing error in which the train appears inverted on the stamp. Only 155 unused and three used examples of this error are know to still exist, including one shown at the Smithsonian website. The above cover franked with a block of four Sc295 is R.P.O. 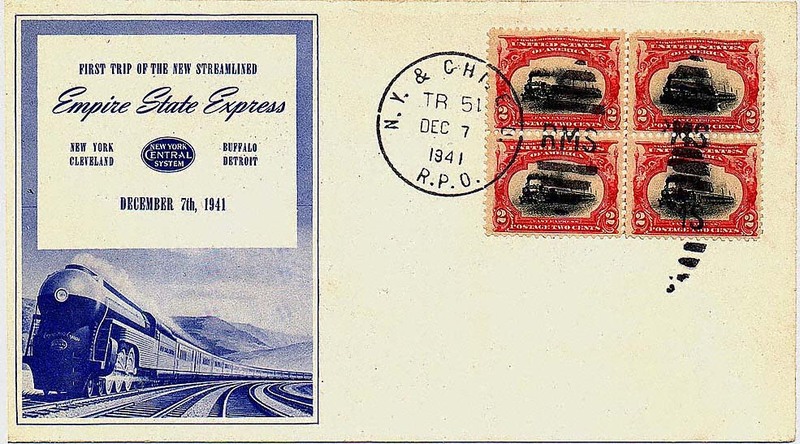 (Railway Post Office) postmarked on the first New York - Buffalo - Cleveland - Detroit run of the New York Central's new streamlined "Empire State Express" (Train 51). The news of this inaugural run on December 7, 1941, made little impact, however, as it was overshadowed by another far more significant event of that day – the bombing of Pearl Harbor which brought the United States into WWII! Copyright: "U.S. Postage Stamps: Protected Since 1978"
Map of Post Offices visited by trains of the Central Pacific Railroad on local lines, Oakland, California. 1876.